Scheduling from the ‘Group Message’ screen. When you have set up the message you wish to send you will be presented with the choice to either ‘Schedule Message’ or ‘Send Message’ as shown below. Selecting ‘Schedule Message’ will open the following window. Message Title: Give the message a title for your reference. Choose Date and Time: Use the calendar and time pickers to choose which day and at what time you wish this message to be sent. 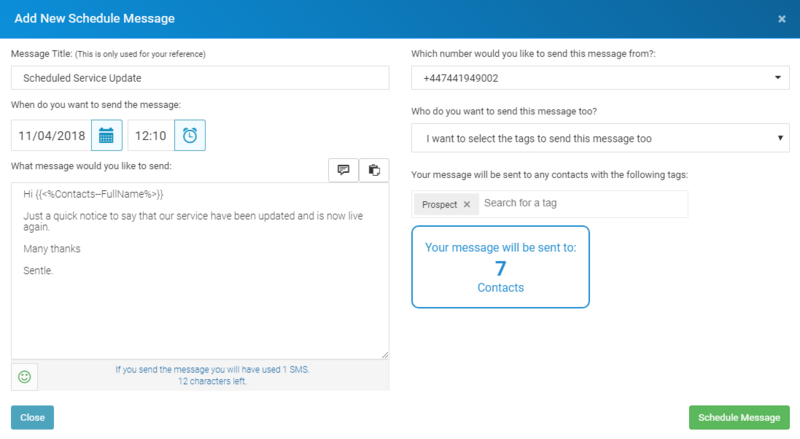 Review Message: Here you can check the message contents and double check how many text credits you will be using when sent. You can edit the message here and make any changes if required. As you have already chosen which tags or contacts to send the message to they will be pre-populated here, but you can amend the recipient list here before sending. This is done by choosing from the drop-down tag menu or selecting to send directly to contacts. Select ‘schedule message’ to add the message to the calendar in readiness for sending. Scheduling from the ‘Scheduled Messages’ calendar. To schedule a new message directly from here you can either click directly on the chosen day within the calendar or use the ‘schedule new message’ button on the left-hand menu. Note: If you choose directly from the calendar the message will be automatically scheduled to be sent on the chosen day although you can edit the date and time as before. 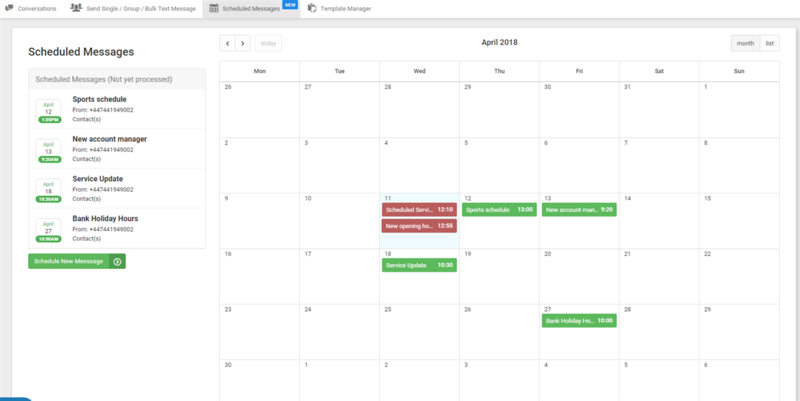 When scheduling a message from the calendar you will have to compose the message or use an existing template and then choose which tags or contacts you wish to send the message to. As before, selecting ‘schedule message’ will set the message to the calendar. You now have scheduled messages!